An ancient pool in the valley of Hinnom, beneath the west side of Mt Zion. It was part of the water supply system of Jerusalem from the Roman period until the late Ottoman period. The "lower aqueduct" was built around the circumference of the pool. 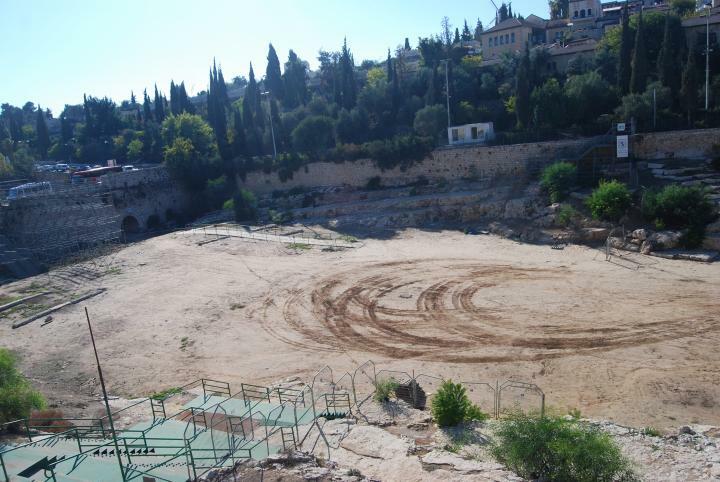 The Sultan's pool was created by constructing a dam in the valley of the son-of-Hinnom, on the west side of the old city walls. The pool , named after the Ottoman Sultans who built it, was a large water reservoir (67M x 169M x12M) which was part of the water supply of the old city. The water was fed from rainfall collected in the basin of the upper side of the valley, and possibly an overfill from the aqueduct. 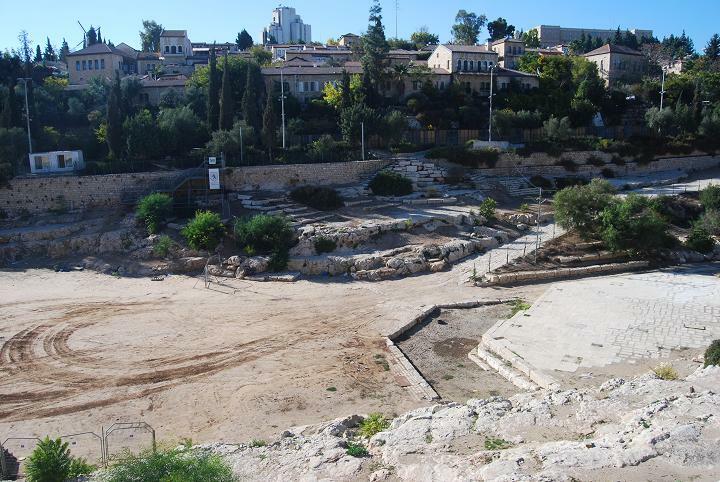 The Herodian aqueduct, which is built around the circumference of the pool, was part of Jerusalem's "lower aqueduct" that delivered water to the city during the Roman period. 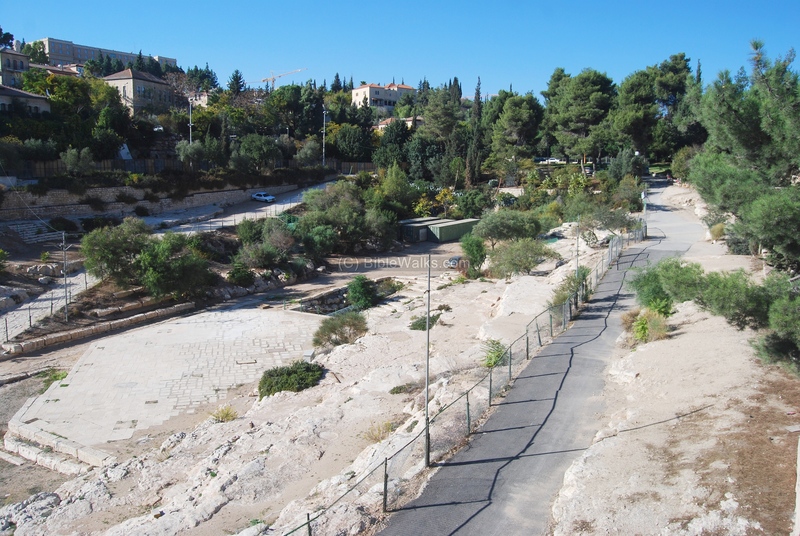 It brought water from Solomon's pools (near Bethlehem), which collected water from springs around that area, all the long way to the temple mount (23KM in total length). The Ottomans added clay pipes into the ancient rock-hewn aqueduct. The aqueduct looped around the pool, and its traces are visible on the east and west sides. 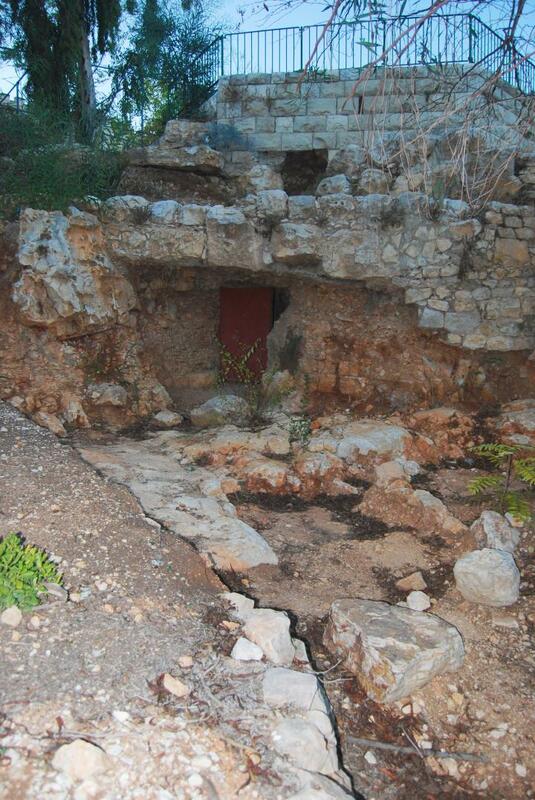 The pool is located in the son-of-Hinnom (Hinom) valley, west of Mt Zion. The bridge passes over the center of the pool and above the valley. Pointing and clicking on selected points in purple will automatically scroll to the relevant photo or site. The valley was the border between the Benjamin (Joshua 18 16) and Jehuda tribes (Joshua 15 8: "And the border went up by the valley of the son of Hinnom unto the south side of the Jebusite; the same is Jerusalem: and the border went up to the top of the mountain that lieth before the valley of Hinnom westward, which is at the end of the valley of the giants northward"). In the Bronze age and beginning of the Israelite period, there were children sacrifices to the pagan God Molech held in the valley of the son-of-Hinnom (Gei Ben-Hinnom). The Israelites stopped this barbarous ritual, although the evil custom continued partially during the times of the Kings. For example, the King of Judah Manasseh (2 Cronicles 33 6:"And he caused his children to pass through the fire in the valley of the son of Hinnom"). The prophets, such as Jeremiah, tried to stop it (Jeremiah 7: 31: "And they have built the high places of Tophet, which is in the valley of the son of Hinnom, to burn their sons and their daughters in the fire; which I commanded them not, neither came it into my heart"). The sacrifice rituals have eventually ceased, but it continued to be used as place to burn the city garbage. The association of the valley with fire, smoke and evil earned it the Hebrew word for "hell" (GeiHennom). According to a tradition this site is the entrance to that evil place. During the second temple period, the pool was probably a Hippodrome. As per Josephus Flavius (Antiquities of the Jews, 15 8 1): "Herod ... appointed solemn games to be celebrated every fifth year, in honor of Caesar, and built a theater at Jerusalem, as also a very great amphitheater in the plain". Herod constructed a massive network of aqueducts in order to supply waters to the city and the temple. The "lower aqueduct" started from "Solomon's pools" at a height of 765M above sea level. Its total length was 23KM, and the vertical drop was 32M, reaching the temple at a height of 735M (slope of about 1M for every 1KM, a remarkable Roman engineering). The last section of the "lower aqueduct", before reaching to Mt Zion, looped around the pool; it followed a constant height of 737M, 27M above the bottom of the pool. The pool was created by blocking the valley on the south edge of the pool. It was in use from the Roman/Byzantine period through the Mamluke/Crusaders and Ottoman periods. The pool was named "Germanus" (German) pool. The Ottoman sultan Barkuk (ruled 1382–1389) rebuilt the walls of the dam on the south-east side in the end of the 14th C, and constructed the first sebil. In June 1536 the sebil was rebuilt by the great builder of Jerusalem, the Ottoman Sultan Suleiman the Magnificent (ruled 1520-1566). An old photo of the site was taken in 1860-1880 by the photographer P. Bergheim. It is named "View of Jerusalem walls from the southwest. Valley of Hinnora and lower pool of Gihon". (Hinnora meaning Hinnom, and Gihon was misplaced with the spring located near the valley of Kidron). 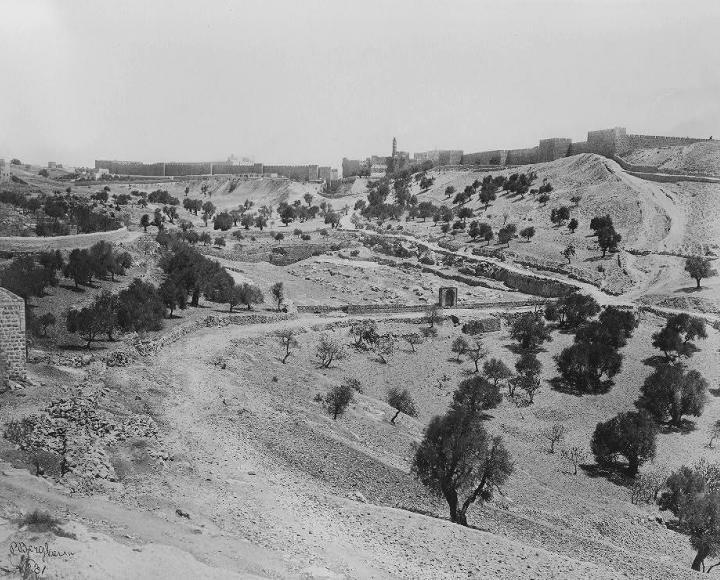 Library of Congress - "View of Jerusalem walls from the southwest. Valley of Hinnora and lower pool of Gihon"
Sultan's pool is used by the municipality to host summer time concerts and festival events. 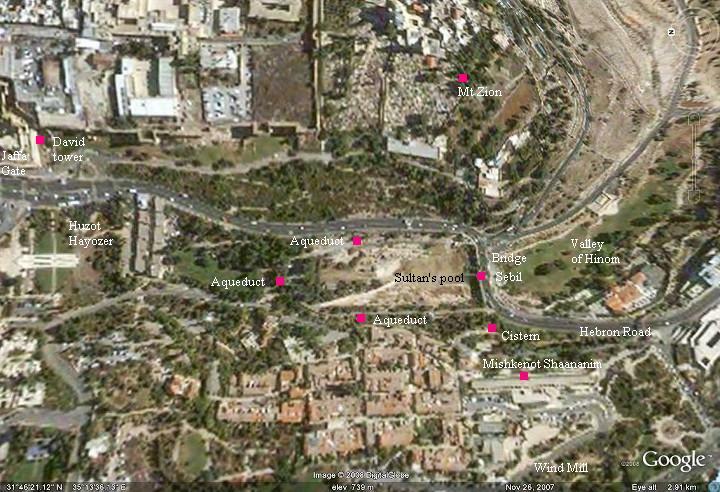 Hopefully in the future the aqueduct will be reconstructed on the northern section and in the gardens of Mishkenot-Shaananim, where it is in better shape although unexposed. A view of the east and south side of the pool is seen below. On the left, high above the valley of Hinnom, is mount Zion. The pool is used for special public performances held in the open air, and the scaffolding structures around the pool are part of the infrastructure used for the shows. The west side of Sultan pool is seen below. 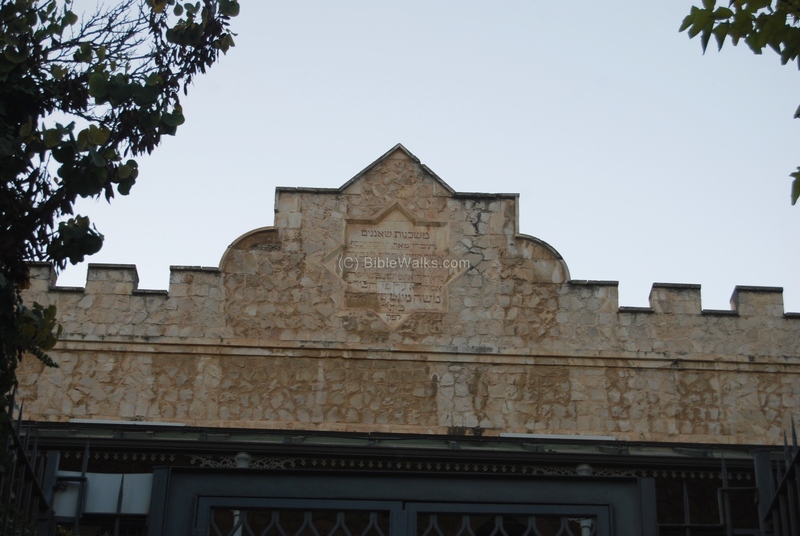 The structure on the western hillside is called "Mishkenot-Shaananim", the first residential structure outside the walls of Jerusalem, which was built by the initiative of Sir Moshe Montifiori in 1860. Montifiori (1784-1885) was a rich Jewish British financer who made major contributions to the early Jewish settlement in Jerusalem. A bank note from 1975 depicts Montifiori's portrait with his famous windmill seen on his right. The stone tablet on the edge of the roof is seen in the photo below. The south side of the pool is seen below. The bridge over the valley of the son-of-Hinnom supports the Hebron road, which leads to Bethlehem. In the center of the bridge is a Sebil - Ottoman drinking fountain. The valley behind the pool is called Gei Ben-Hinnom ("valley of the son of Hinnom"). It flows into the Kidron valley to the east. The photo below shows the valley at the southern foothills of Mount Zion, which are seen on the left side. This deep valley made Jerusalem protected from this south side and the west side. A view of the northern edge of the pool. The aqueduct was constructed above the circumference of the pool, going from the left side, around the wall at the edge of the pool, and to the back of the right side. On the right side, under the road, are some blocked rock-hewn tombs dated to the 1st temple period. A section of the aqueduct can be seen on the eastern side of the pool, under the busy Hebron road. 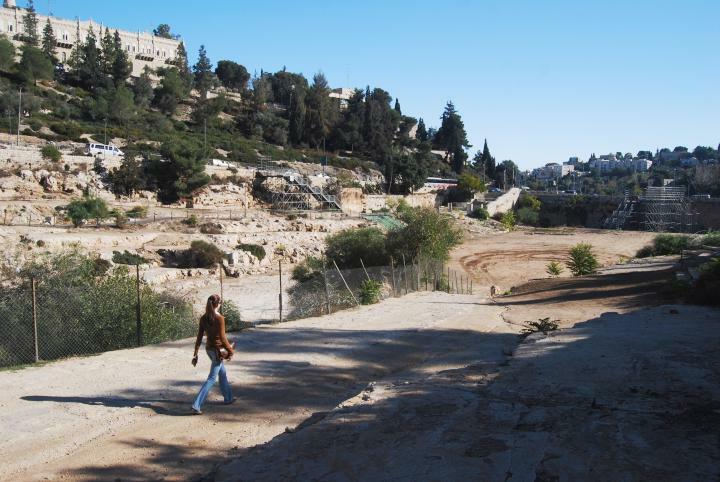 It continued along the southern slopes of Mt Zion towards the temple mount. 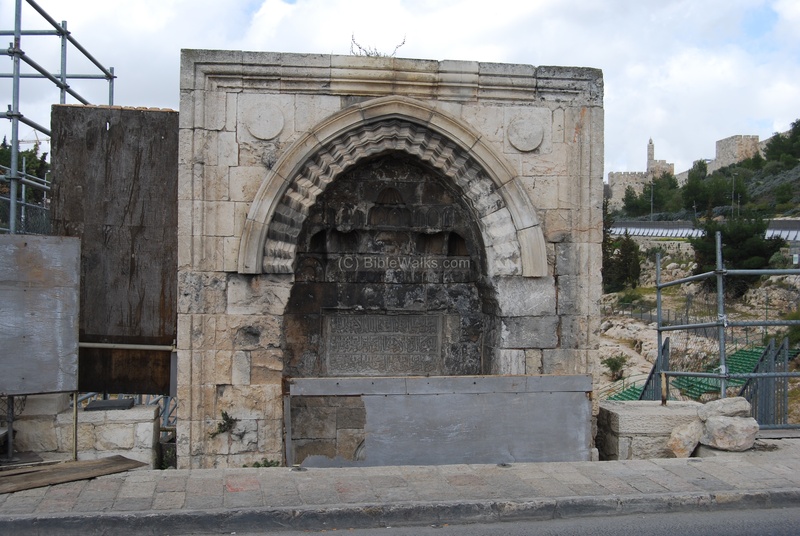 An Ottoman sebil (Turkish name for a drinking fountain) is located on the south side of the pool, on the bridge of Hebron road, over the Valley of son-of-Hinnom. The sebil was built in June 1536 by the Ottoman Sultan Suleiman the Magnificent (reigned 1520-1566). This great builder of Jerusalem built additional 4 sebils inside the walls. The inscription reads: "Instructed us to build here a drinking place, our lord the Sultan, the great King... Sultan Suleiman son of Sultan Selim Khan, Allah will keep his kingdom and government for eternity". The water supply for the sebil came from the aqueduct on the west side of the pool. A structure, which included a cistern, diverted some of the water from the aqueduct to the water to the fountain. The cistern is located behind the red door seen below. This point is marked on the P.E.F. survey plan of 1865 as level 2420' (737.6M), while the sebil is at lower height (2332' or 710.79M). Sultan's pool - Sultan - Arabic: ruler. The pool is named after Ottoman rulers who rebuilt the dam and pool, and constructed a sebil. Aqueduct -The name is based on the combination of the Latin words "Aqua" (water) and "ducere" (channel or pipe). The word "Ma'im" means water. It appears many times in the Bible, since "water is life". The word "Amma" is based on the Hebrew word for "female servant" or "maid servant", since it was her job in Biblical times to fetch the water. Biblical reference (Judges 9 18): "...the son of his maidservant...". Amma has another meaning, which is a unit of length (translated to "cubit"). Aqueducts are long so perhaps it may be source of the name. One of the Biblical references: (Genesis 6 15):"The length of the ark shall be three hundred cubits". Ben-Hinnom - The valley is named in Hebrew "Gei ben Hinnom" , meaning the valley of the son of Hinnom (who this person was, or why the valley was named after him, is not clear). The valley is the source of the Hebrew word for Gehinom (Gehenna, Tephet, Hell). The symbol of evil is based on the fact that in ancient times children were sacrificed to the pagan god Molech; later the city garbage was burnt here. There are many Biblical references: (Jeremiah 7: 31: "And they have built the high places of Tophet, which is in the valley of the son of Hinnom, to burn their sons and their daughters in the fire; which I commanded them not, neither came it into my heart"). Excavations Apr 2010 (IAA, Yehiel Zelinger): "A salvage excavation was conducted for the purpose of infrastructure development in the northeastern corner of the pool, at the foot of Yemin Moshe and Hutzot Ha-Yotzer. An impressive section of the Low Level aqueduct was exposed on top of a retaining wall running from south to north and where it curves to the east crossing the ravine (in the channel where the Sultan’s Pool is located). So far we have discovered two arches of the well-built ashlar bridge that spanned the ravine. Based on photographs taken in the nineteenth century the upper part of the bridge was exposed at that time. A monumental inscription was also visible then above one of the arches; it dedicated the structure to the Sultan Al-Malik Al-Natzur Qala’un in the year 1320/1 CE".